How do you eat a whale? One bite at a time. How do you teach history? The same way. The history of us—North Dakotans, Americans, humans, the planet—is a really big story. We break it down, one bite at a time, into arbitrary regions and time periods to make it easier to process. At places like the North Dakota Heritage Center & State Museum in Bismarck and our state historic sites, we try to have a comprehensive, encyclopedic approach to telling the story of North Dakota. If something has happened within the borders of the state to the people who have lived here (even for the briefest time), we try to capture that story when we can. We break the “big picture” story down into lots of little stories and themes. We try our best to identify these stories, preserve them, interpret them, and promote them. This means we also have to make some very hard decisions. We have committees that decide everything from what objects we collect to what history books get sold in the store. There are a lot of people who help decide which stories are highlighted on any given day at the State Museum. 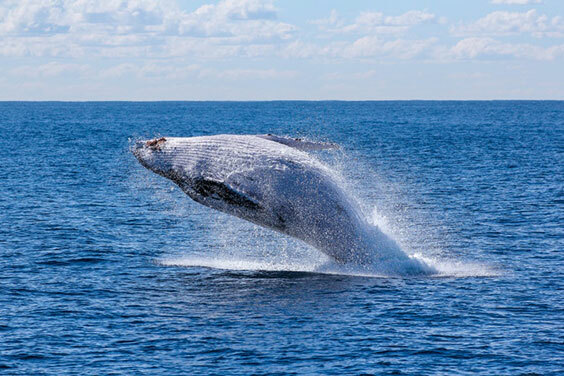 Grey Whale breaches the ocean. My job as an outreach coordinator with the North Dakota Studies project is to help educators break this whale of a story down into bite-size pieces for their students. Rather than having educators try to teach all of North Dakota history in just a few weeks, we help teachers and their students to think like historians, so they find the bite-size stories that they are interested in and learn to think critically about how that story is interpreted. Instead of having students memorize an encyclopedia’s worth of names, places, and dates, museum educators would rather students learn more about how historians think. How do we develop good questions to ask of the past? How do we find and analyze sources to know whether they are accurate? Does the evidence support our hypothesis? The key to making all of this relevant and interesting to students is the questions we ask. We want to ask questions of history that lead to investigation and analysis. We want students to become history detectives. Instead of simply telling students what type of shelter people of the past used, we want them to think about what type of resources would have been available in a particular location. When we look at illustrations of tipis, earthlodges, forts, and sod cabins, we want them to think about why someone might be living in that particular style of housing. Why would someone build a fort? Why would a tipi be useful? Solving these puzzles is more interesting and engaging than simply memorizing textbook information. 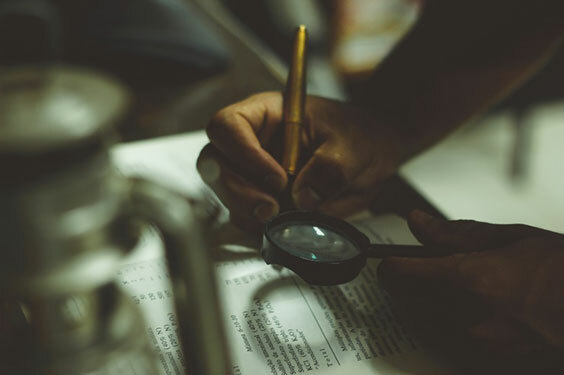 The single most useful question my colleagues and I ask of the content we work with is “How do we know?” Try using this question the next time you are visiting an exhibit or reading a book, and see if it leads to some detective work of your own. Solving history's mysteries: How do we know what we know? Among the many things about my job I truly enjoy are the opportunities that arise, for one reason or another, to get out of the office on a beautiful, sunny day! Being able to visit one of the state historic sites that I’ve never been to is an added bonus. Even better if I get to visit TWO sites. And if I also have the opportunity to fly our quadcopter at those sites . . . well then, you’ve just about described a perfect work day for me! To date, I’ve piloted a UAV at 13 prehistoric or historic archaeological sites in North Dakota, including 9 state historic sites managed by the State Historical Society. I hope to fly a great deal more in 2019 and beyond. The technology, opportunities for application, and regulatory environment have all evolved since our earliest flights in 2014. But the reasons for these flights all share the same basic purpose: to document preservation concerns about cultural resources, and to enable interpretation and management of North Dakota’s state historic sites. 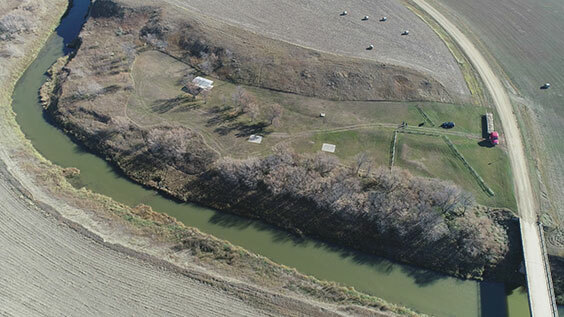 Aerial image of Cannonball Stage Station State Historic Site, Grant County, North Dakota, taken by State Historical Society quadcopter on October 17, 2018. View is to the east. The altitude of the quadcopter was 400 feet and wind speed was 5-7 miles per hour when this image was taken. Surface depressions marking the location of two dugout structures and a barn are visible near the fenced area. I was fortunate to fly the quadcopter at two sites on a beautiful fall day in October 2018. I’d like to share some images and video from these recent flights over the Cannonball Stage Station and Fort Mandan Overlook State Historic Sites. Cannonball Stage Station and Fort Mandan Overlook are among the lesser visited of the 57 historic sites in our state. Both are in beautiful, remote locations and definitely off the beaten path. Located near Raleigh, in Grant County, North Dakota, the Cannonball Stage Station was the fifth stop after Bismarck on the Bismarck to Deadwood Stage Trail. For a brief period from 1877 to 1880, a booming stagecoach line linked the westernmost stop of the Northern Pacific Railroad in Bismarck to the gold fields of the Black Hills. Travelers would have the opportunity to have a short rest and a quick meal here while horses were swapped, and the stage was quickly back on its way. This unique period in North Dakota is well- interpreted at the site, picnic facilities are available, and it’s a peaceful spot. Earthen dugouts clearly visible at the site represent the locations of the stage office, another building, and a barn. Check out a video from a recent UAV flight at Cannonball Stage Station State Historic Site. Aerial image of Fort Mandan Overlook State Historic Site, McLean County, North Dakota, taken by State Historical Society quadcopter on October 16, 2018. View is to the northwest. The altitude of the quadcopter was approximately 100 feet above ground surface, with winds gusting to 30 miles per hour when this image was taken. Two historical markers present at the site are visible in this image, as well as the dramatic bluff edge. Fort Mandan Overlook State Historic Site is located near Washburn, North Dakota, in McLean County. This site overlooks the former location of Fort Mandan, constructed and occupied during the fall and winter of 1804–1805 by the Lewis and Clark Expedition. The fort location has long since been eroded away by the nearby Missouri River, but there are other stories here as well. During archaeological investigations conducted at the site by the State Historical Society in 1991–1992, a fortification ditch dating to the late 1700s–early 1800s and a Plains Village campsite dating to the 14th century were documented. Interpretive signs are present, and the viewshed from this location is stunning. Watch your step, though—the bluff edge is steep. 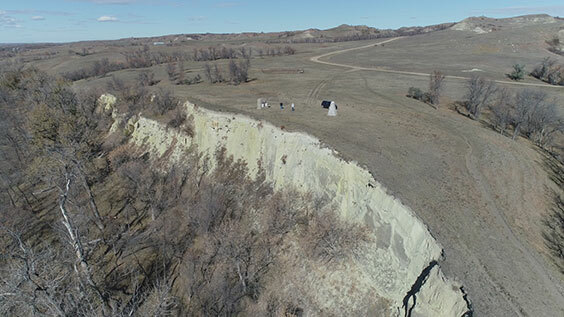 Check out the video from a recent UAV flight at Fort Mandan Overlook State Historic Site. I was happy to add Cannonball Stage Station and the Fort Mandan Overlook to the list of state historic sites I’ve visited and documented from the air. Someday, I’m going to get to every one of them. In the meantime, I hope you’ll consider a trip sometime soon to these or one of the many other state historic sites in North Dakota. I hope the video links in this blog help to give you just a hint of the historical significance and natural beauty of these locations. The videos were a lot of fun to shoot! Many thanks to the video editor who helped me out on short notice, and to the Bismarck/Mandan local musicians that provided the accompanying music. Enjoy!